A toothache can have at its heart one or more causes, whether its tooth decay, tooth fracture or infected gums. Did you know that peppermint leaves can reduce toothache? Among the different kinds of remedies that you can employ to relieve yourself of toothache, peppermint leaves are one of the most effective ways in providing temporary respite. 1. Chew some fresh peppermint leaves to experience its cooling sensation and bring down the soreness. 2. 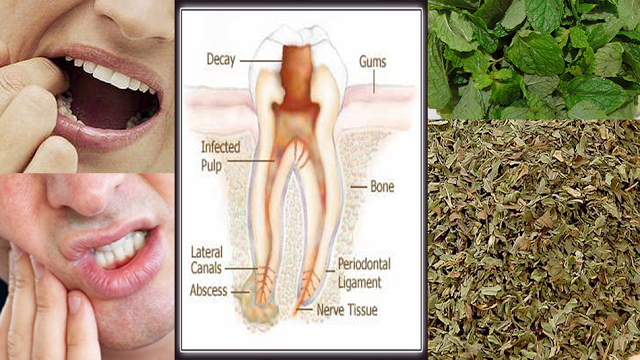 You could lessen the swelling by holding dried peppermint leaves against the aching tooth. 3. Even having peppermint tea can provide you with respite from the pain. Add 1 teaspoon of peppermint leaves. Let it steep for about 20 minutes before allowing the tea to cool down. And gargle it in your mouth before throwing it out.